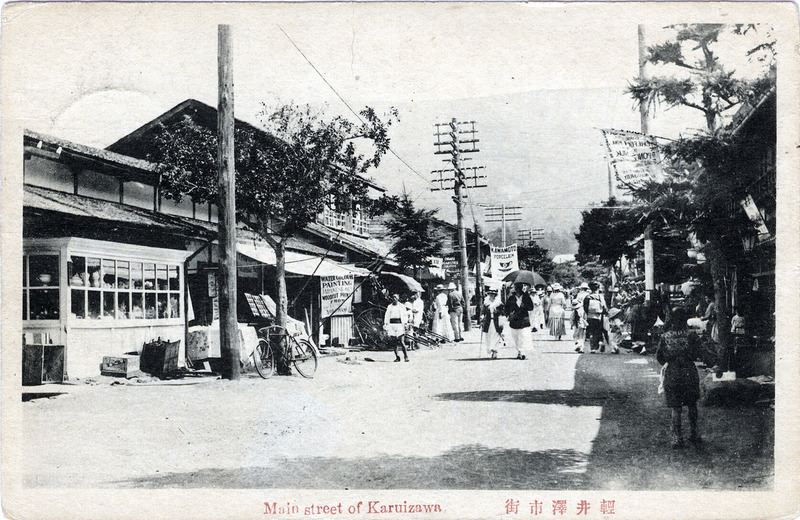 “Main street of Karuizawa”, c. 1920. The former Nakasendo post station had fallen into decline after the Restoration until being “discovered” in the late 19th century by Westerners as a retreat from the summer heat and humidity of the coastal lowlands. 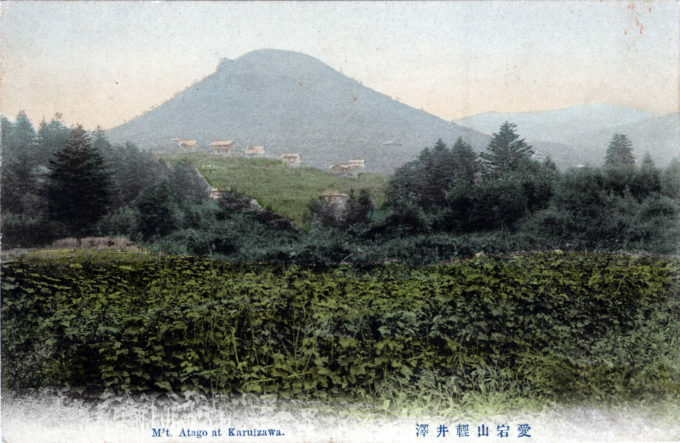 “An important part of my school years [in the 1920s] consisted of the long summers we spent at our summer home in Karuizawa, 5,000 feet high in the mountains eighty miles northwest of Tokyo. Karuizawa had been founded as a summer resort by missionaries in the late nineteenth century, but some rich, aristocratic Japanese and a few of the embassies also had establishments there. “… Karuizawa was small in those days, consisting of a little Japanese village, once a post station on a through highway, a modern railway station with a few houses more than a mile away, and a scattering of summer houses. Our cottage stood at the beginning of a steep rise up to the ridge that formed the eastern edge of the broad pocket in the mountains in which Karuizawa nestles. 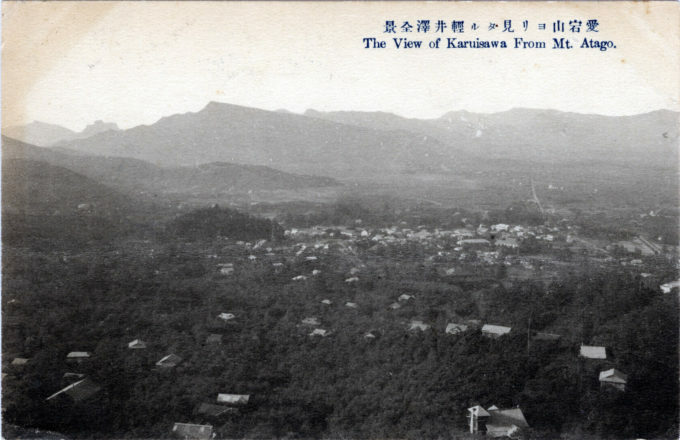 By rigorously topping the trees in front of the house each year, my father preserved a fine open view from our home out over the whole of Karuizawa. “… We hiked all over the mountains of the Karuizawa area and in later years made an annual ascent of Asama, eruptions permitting, but the chief focus of our childhood activities was the tennis courts. My partner was a Canadian, Herb Norman. Under his fuller name of E. Herbert Norman, he was to become well known as a gifted scholar of modern Japanese history [and] an outstanding Canadian diplomat. “… Summers in Karuizawa were not just a break in the year but seemed a whole lifetime in themselves. I have far more memories of the minutiae of life there than I do of the much longer periods of time spent in Tokyo. Although I have been to Karuizawa only two or three times briefly since I was sixteen, it remains crystal clear in my mind’s eye. Mt. Atago, Karuizawa, c. 1910. A portion of gaijin-mura (foreigners’ village) is visible on the ridge. 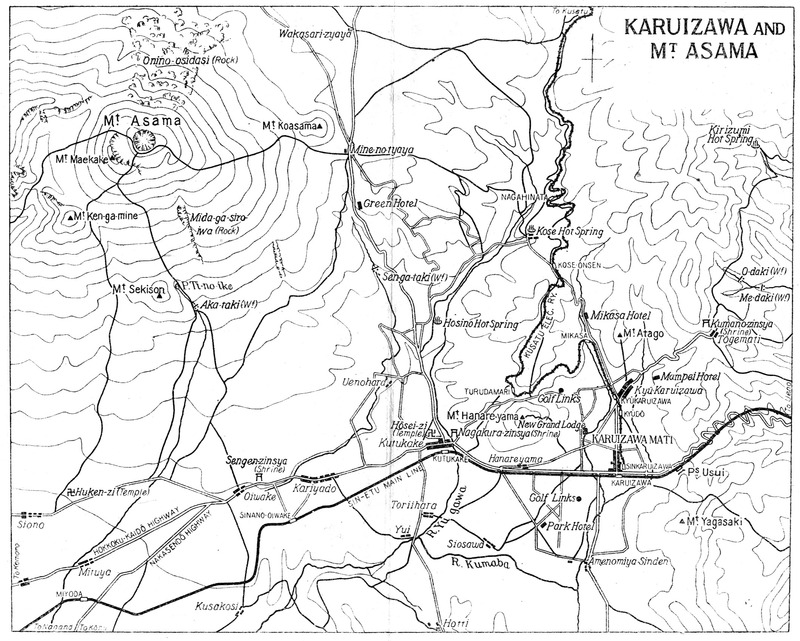 “Karuizawa was formerly – up to that distant date, when primary education was established in England [ca. 1870] – a posting-station (fifty men and fifty horses kept) on the great Nakasendo, the road which runs inland from Tokyo to Kyoto, while the more frequented Tokaido links the two capitals by a route which hugs the Pacific coast. “The inhabitants gained their living almost entirely from their services to noble travellers on the road: but when in 1868 a few young Samurai dissolved the feudal system, and so relieved the Daimios from the obligation of their periodical journeys to Yedo, and when a little later railways came, with [travel measured in] hours instead of days, Karuizawa people – like too many others in Japan just then – were altogether adrift, left to shift for themselves. “Then some missionaries discovered that the site was exactly what they wanted as a summer resort, houses cheap to hire or build, service in plenty, and surroundings so primitive that they might live in a free-and-easy way, without the fear of invasion by fashionable’ tourists who would make things dear and strike a discordant note in the calm retreat. “Thus a phoenix rose on the ruin of the irrevocable past: presently, as summer set in down below, butchers’ meat and Western ‘groceries’ came up, exhibited behind glass windows, to the amazement of the old inhabitants; then, as Western comforts grew more common, until actual cows were kept and milked, wives and children of business-men in the Ports were consigned to swell the missionary group; in ’93 the Government built the many-tunnelled Abt-rail [rack railway] track, and Karuizawa became a station on a trunk-line connecting the two seas; when the ‘Manpei Hotel’ was opened (with a signboard painted in foreign letters) and table d’hote was naturalized, the coddled tourist thought that he must have ‘a look in’ too, just to see if Asama really were as ‘active’ as they said; while quite recently even Japanese gentlemen of high degree have begun to build houses and introduce their families. The View of Karuizawa from Mt. Atago, c. 1920. In the foreground are summer cottages of gaijin-mura (foreigners’ village). “There are two Karuizawas, one Kyu-Karuizawa, or ‘Old Karuizawa’, which is on the Nakasendo highway and lies very near the base of Usui and Atago ; the other, Shin-Karuizawa, or ‘New Karuizawa’, is a recent village created after the opening of the railway and is situated near Yagasaki-yama, being separated from Kyu-Karuizawa by only % m. The population of the two sections totals 1,953, divided into 597 houses, of which 178 are summer villas for both foreigners and Japanese.